It's happened again. This time it was dangerously close to home, at Marjory Stoneman Douglas High School in Parkland, just 40 miles from Miami. Another senseless loss of young lives due to gun violence. Along with grieving for the families and friends affected by yet another mass shooting, at times like this many ask what they can do to affect change to help prevent another incident. While there is much work needed to move the country towards more sensible gun regulation, there is a way to make a positive impact on society through financial decisions with socially responsible investing (SRI) funds. 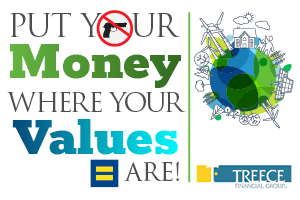 From funds that do not support gun, ammunition, and tobacco manufacturers— to funds that do support environmental conservation—sustainable agriculture—LGBT-supportive companies—investments can be positioned to provide financial returns while a natural expression of an investor’s core values and beliefs. On a related note, one action that Treece Financial Group has taken is severing its' business ties with FedEx, due to that company's continued support of the NRA. What actions will you take today to make a difference?